Sawn Rocks/Killarney Gap, November 2009. 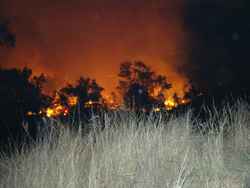 A bushfire started by a vehicle fire threatened properties near Killarney Gap. 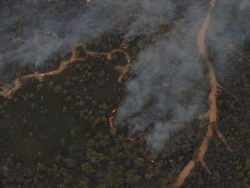 Pilliga Forest, November/December 2006. A set of scrub fires burned out 100,000 hectares in just their first day. Kaputar, November/December 2006. This fire burned out over 14,000 hectares of the national park. For accurate and current fire information visit the Rural Fire Service website. In particular their Major Fire Updates and Current Incidents pages are extremely useful. Also be sure to check out our MODIS Rapid Response System satellite imagery.